​​​​​​​​ GEORGETOWN – HOLT CAT is breaking ground on a full service sales, rental and parts facility. 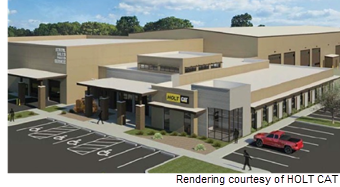 The heavy equipment dealer is building its largest retail center in three decades at 2101 Airport Rd., near Lakeway Dr. and I-35. According to CEO Peter Holt​​, between 100 and 125 people will work there. Mayor Dale Ross said over the next ten years the facility will add about $13 million to the Georgetown economy.